Local Owner - Gorgeous Western Corner Unit - Not Your Typical Rental! Free Beach Chair Upgrade package for returning guests within 12 months. STUNNING, SOPHISTICATED, UPDATED CONDO Unit 307 is a premier 2 bedroom 2 bath condominium located in the gorgeous 14 story Crystal Shores complex within walking distance of shopping, dinner, drinks and more. As of April 2018 I now also own Unit 706 so now I have 2 rentals at Crystal Shores!! If this is booked check out my other listing on VRBO (#652368) just 4 floor higher in this same complex! Please note that ALL units in Crystal Shores are 1056 sq ft. They are 2 bedroom and 2 bath as original built. Before you read about my unit a bit of a public service announcement. VRBO posts "daily rates" which in theory help you figure out which units cost more or less. As in all situations. It pays to check out the total bottom line cost, not the posted "daily cost". You can thank me later :). Please read my listing & reviews to make sure this is a good fit for your vacation plans as CS307 is not your typical 2 bedroom sleeps 6 model (it doesn't)! My unit only sleeps 4. No sleeper sofa... no air mattresses, etc. There is just not enough room for more than 4 folks to relax in 1056 sqft for a week at a time. My goal is to provide a property designed around creating an environment where guests look to return again and again. If you are looking for a bargain price or a last minute special on a rental property, this is not the unit for you. This is not a rental property but a property that I rent. If you opt for the Beach Chair Upgrade Option, add $67.80 ($60 plus 13% AL tax) to the bottom line of the quote. My goal is to provide an exceptional vacation experience as to your accommodations while in Gulf Shores. There are more expensive as well as cheaper units available in Crystal Shores but few if any will match 307 as to the quality of the vacation experience delivered for the money you spend. That it is my only objective... the best value for the money. Read my most recent reviews and those 6 years ago (which you cannot do anymore as VRBO has deemed the immaterial in this world of Book It Now... which I also don't support. I strive for the same exceptional experience today as I did on day one and a number of my guests return often for that very reason. Every guest, every time as this YOUR vacation time and it should be stress free!. LOCATION, LOCATION, LOCATION - This breathtaking 3rd floor West corner unit directly overlooks the pool, the beach boardwalk, and you are only 30 seconds away from the work out and game room facilities! You can take the stairs directly outside this unit and be at the pool within 1 minute and literally be on the beach within 2 minutes and in Gulf in less than 3 minutes. This unit comes has 1 reserved covered (no sun/hail damage) parking space within 50 feet of the 2 elevators. A second additional parking space is available in the non-reserved portion of the parking area if needed for an additional $22.60 (tax Included). Crystal Shores is one of the newer (2004) 2 bedroom condominium complexes on the quieter West Beach sitting directly on the white sand beaches of Gulf Shores. Complete with an indoor/outdoor pool, hot tub, dry sauna, work-out room with TV’s allowing you to easily overlook both the beach and the pool! The game room is equipped with both pool and foosball tables for your enjoyment off the beach. Secured WIFI Internet is included as is NETFLIX for those occasional rainy days when you have to stay in so no need to run to the store for Redbox. Charcoal grills are available for our guests use as well but you must bring your own charcoal/starter/lighter. Rental chaise lounges/umbrella's are available March to November from a 3rd party for $180/week. There is a place to leave YOUR beach chairs in a beach side storage area but consider bringing a cable lock to secure them. Please note that as of March 2018 the storage area requires code or FOB access as does the beach, the pool, and exercise and game room areas so as to limit access to Crystal Shores owners and guests. I provide 4 FOBs on wrist bands. This a corner unit with 9 ft ceilings so it has a light and airy feeling to it. I have updated, upgraded, and up-scaled from top to bottom! I have elected to appoint this unit very comfortably for 4 adults (1 King and 1 Queen bed). I only rent weekly and I only Saturday to Saturday. If you need something else I will try and help you find that. Upscale bedding is in both bedrooms which have “Ecowood” tile floors and sisal carpet runners. Both bedrooms feature flat screen TV's. The main room has a 43” Samsung Plasma with Dish TV and a BluRay/NETFLIX/DVD/CD player. There are granite top tables and 2 recliners (one rocks & swivels) completing the furnishings in the main room. The dining room set has 4 leather chairs and an alligator glass topped table with 2 more matching bar chairs. Again my focus is a great vacation space for up to 4 persons. The kitchen is fully stocked, has both granite counters and granite/stone/glass tile back splash for those who savor cooking, an upscale cozy space to do so. All new GE appliances as of December 2018. The in unit laundry room features upgraded full size Maytag Bravos HE washer and dryer with a drying rack, an iron and ironing board with the laundry detergent provided. The sheets and towels are replaced annually with 600 count equivalent microfiber and plush towels. Both providing a difference you will feel! My unit has been furnished with a rich mixture of colors, textures, with original art work throughout. The well-appointed living and dining rooms boast style, function, and comfort. One thing you must experience in person however is the sunsets from this corner unit as they do not readily translate into either pictures or words. Whether you have stayed at Crystal Shores before or not, please take a moment to read the comments from my guests as to their stay at Unit 307 as I work very hard to make your stay at my condo truly exceptional! The balcony directly overlooks the beach and the pool, and no unit is closer to both. On the balcony or inside with the doors open you will hear AND SEE the surf cascading onto the white sand beaches. It is furnished with a selection of 4 HDPE captains chairs, 2 with a connecting table so as to provide a view above the railings. During the hot summer months you remain cool in the shade. During the cooler winter months you will feel the warmth of the sun relaxing in those same chairs providing you with a great unobstructed view of the sunset on the beach as effective 1-1-2016 items left on the beach will be considered abandoned by the City of Gulf Shores and disposed of at your expense. In order to accommodate some guest requests I now offer an upgrade option for $67.80/week (tax included). This upgrade provides: 4 folding wood rocking chairs with headrests as well as a cup/cellphone phone holder. 4 Beach Towels. 2 wireless speakers for IPOD (yours) or my MP3 player with over 800 'best of' 70's and 80's tunes included. 1 George Foreman electric outdoor grill for use on the balcony, a 3 gallon compressor so you can blow up your beach items daily as desired, and a cooler for the beach. Those are available at no charge to returning guests within 12 months. I actually live in Gulf Shores so you can expect it to be very clean, completely stocked (soap/paper products/cleaners), and in good condition upon your arrival, no excuses. If there is an issue or one that comes up, I live only 5 miles away. There are no pets allowed at Crystal Shores except for owners. This is a non-smoking unit as well including the balcony. There is community use smoking area on the first and second floors available. While I appreciate your interest in my unit I do not entertain/accept/reply to discounted offers. If you have a limited budget to spend I would be happy to help you with some suggestions perhaps for other complexes to consider. ALL RENTALS ARE WEEKLY AND RUN SATURDAY TO SATURDAY. DEPOSIT - The Deposit would be in addition to the Rental Rate and a $300 deposit is required to hold a date for a weekly or daily rental. A $600 deposit is required for a rental lasting 4 or more weeks. Check in time is 2:30 PM and check out time is 8:30 AM. I try and get you in and out before traffic builds which indeed it does on Saturdays. The condo association does not allow RV's or trailers on the property nor are pets allowed. There is no smoking in my unit or on my balcony. CALENDAR - Please consult the calendar for available dates as it is ALWAYS current. Once paid in full you will be sent an email prior to your arrival with an access code to the key less lock. The parking pass(es) will be inside on the counter so nothing to forget and nothing to pick-up or return. VRBO refunds the deposit after 7 days provided there are no lost or damaged items. Vacations should be simple and relaxing so I've tried to make that true from the moment you view this listing to the moment you get an email notification your deposit has already been processed once you've left Gulf Shores (for rentals not via VRBO... those they send directly to you within a week of depature). I purchased this property in November of 2011 with the intention to rent it to adults and it is furnished as such. Your children are welcome but there are no games/toys/floaties/beach pails provided with this unit so please be sure to bring those types of items with you if they are needed. There are literally thousands of condo's available for rental in Gulf Shores and Orange Beach. The goal for this condo was specifically to create an environment where vacation memories would be created for a party of 4. As of May 2012 I relocated from IL and now live in Gulf Shores so as to be able to personally provide the cleaning and maintenance for my unit and a few others at this complex. There are no 3rd party maintenance or cleaning people involved with my unit. This is not my vacation home that I rent out to help cover the costs. The left over furniture and dishes end up in my home and the new furnishings and linens end up here! If you are looking to make vacation memories with your loved ones, I am literally here now to help you accomplish that while staying at my unit. LOCATION, LOCATION, LOCATION...Please read my guests reviews as to why Unit 307. Gulf Shores has beautiful fine white sand beaches, some of the best in the US. Crystal Shores is one of the premier properties having year round amenities and within walking distance to a number of places to eat or shop. Forgot toothpaste, the Pier 33 grocery store is within a 5 minute walk for just such occasions. Crystal Shores is a nice location within Gulf Shores... close but not too close to everything. Within Crystal Shores, unit 307 has the best location. It is an end unit with an unobstructed view down the beach to the west. You can look down onto the pool/hut tub and close enough to actually speak to someone below without shouting from the balcony. The work out and game room as well as the sauna are literally right below. The reserved covered parking space is about 50-60 feet from the 2 elevators and the second floor parking access is even closer just up 1 flight of stairs. Down those same stairs the beach is less than 2 minutes away from this unit.... and that is at a leisurely pace. After all you are on vacation while here! While I can't control the weather or the traffic, I do clean and maintain my own unit personally so I can and do control what you will experience inside of the unit while you are here. If you read the reviews, most have been kind enough to comment as to the quality of the amenities and level of cleanliness they observed. I very much listen to what my guests say they need and to the extent I can, make improvements/adjustments. Should you decide to stay here, hopefully you too will also notice and comment on those differences. From the start Crystal Shores 307 was never meant to be just another rental property. I do not treat my guests as renters and I do not expect my guests to treat this as a rental unit either. If that sounds like the vacation experience you are seeking, I look forward to providing that for you! The beautiful white sand beaches are literally 1 to 2 minutes away from this unit as is the pool, the sauna, the the hot tub, the game room, the work out facilities and your car in a reserved covered parking space. Best of all however is the view to the west. No way to describe it short of breathtaking! 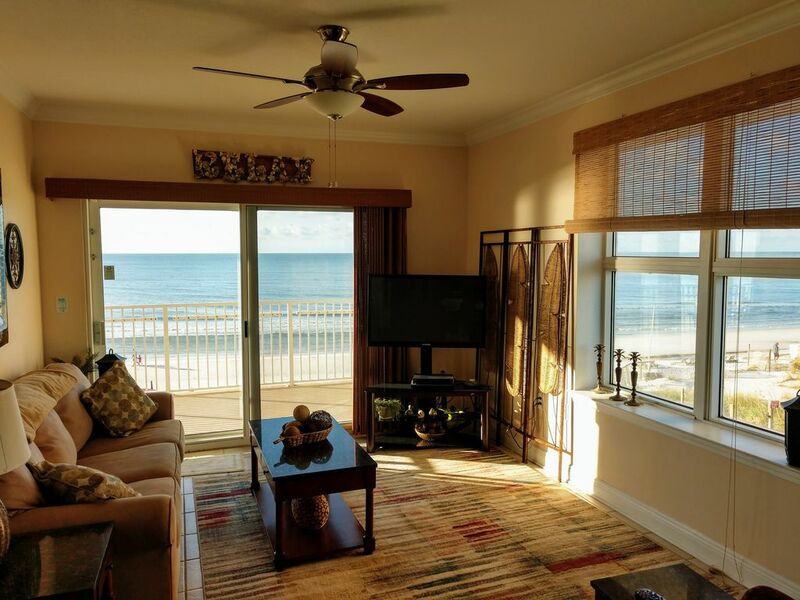 When you stay at Crystal Shores 307, you feel like you are at the beach... not just looking at it! We have secured (coded lock and security camera's on the entrance) beach side storage so less to haul back and forth to your car or unit while here. toilet, combination tub/shower, Master bathroom. ADA height toilet, hairdryer. toilet, combination tub/shower, Hall bath with private guest room access. ADA height toilet. 2 updated rubbed oil faucets, shower trim, towel bars etc. Toilets are ADA height with no slam seat lids. Gulf of Mexico white pristine sand beaches recently restored (adding about 75 feet of beach into the Gulf). Nicely equipped directly below unit but no sound issues. Ceramic cook top, pizza stone provided. Large glass top alligator finish with leather chairs. 8' Ft table directly below unit. Has swim through to indoor heated pool from May through Sept/Oct. depending on weather. Optional $66.60 (includes tax) Weekly upgrade includes 4 wooden rocking beach chairs, 4 aluminum waters edge low rider chairs, 2 umbrellas, 1 cooler, George Foreman Electric outdoor grill, 4 beach towels, a 110V compressor for your inflatibles, MP3 player with WiFi remote speakers. We had a great time staying at Michael's place. He seemed to have everything you could possibly need and more for vacationing in Gulf Shores. I would highly recommend staying at his place. It has all the amenities and is conveniently located near most everything there is to do while staying there. His place was extremely clean and comfortable. Thanks for having us. This unit was perfect for our Spring break getaway with 17 yr old daughter. As owner's description mentions, CS307 is less than a minute from the pool, and literally 3-5 minutes to the surf. We appreciated being able to look out the window right over the pool to keep tabs on daughter!! Michael was a genial host and keeps a pin-neat unit that's well stocked with anything needed to cook while staying there. Top notch appliances, comfortable living room furniture to relax in and wonderful beds after a day at the beach couldn't have been better. Having 4 towels, a cooler, 4 beach chairs, and a grill available for use were definitely worth the little extra $$ that Michael offers them for- grateful that we didn't have to bring them from home !!! Storing chairs and beach items is a breeze in this building - secure storage right downstairs steps from the walkover to the beach. If you are hesitating on choosing a unit for up to 4 people and this one is one the short list - take my word for it - you will be glad you picked CS307! Perfect location. And perfect accommodations... we will be back!! Glad you guys liked it... I too think it is the perfect location.... Both in Gulf Shores as well as in Crystal Shores! Awesome condo and Fabulous View!!! Everything was perfect and we enjoyed our stay very much!! Glad you folks liked it and hope to see you back again one day! Very much appreicated starting the laundry as next guests arrived the night before and were anxious to get in ASAP!. Spent an amazing week here with wife and daughter .The condo was just like it was described and much more, . It was gorgeous with amazing views and was very clean, it felt like home. Was in a perfect location. W e sat on the balcony for hours, it was so relaxing and we could sit there and watch our daughter swim in the pool. Michael was very nice and helpful. He took time to make suggestions on places to eat and things to do. We really loved Desoto's. It is great to see an owner take such pride in his property and keep it clean and beautifully decorated like he does for his guest. It is a very special place. This was our first trip to Gulf Shores and we will definitely be back. We loved this condo. Glad you all enjoyed your stay is CS307. Hope to see you all back real soon! The unit was outstanding. The owner is great. Smoking in the building is awful. If smoking bothers you, I wouldn’t recommend GS. We have never seen more inconsiderate smokers. On a one-half mile walk on the beach, I counted 52 cigarette butts! Was happy to call manager next door and advise her that her guests were smoking and even shared with her language to place into her contract to stop smoking on her balcony. Already on the next Board meeting agenda is to make building non-smoking except for a place we will provide on the second floor parking deck next to ramp... literally about 80 ft from the building. Hopefully I will be able to get 2 more Board members to support that effort!! Thanks again for choosing CS307 as I do try and provide and outstanding unit and I do whatever I can to make my guests stay the best it can be. WIll keep you posted on how it goes. Google 'Orange Beach Gulf Shores Concerts' for calendar of national acts coming to the Hang Out (walking distance) or the Wharf in Orange Beach. Hurricanes are a fact of life in the Gulf. It is strongly recommended you consider the purchase of travel insurance when traveling in hurricane season (6-1 to 12-1). We will refund prorated rental (not cleaning or parking fees or taxes for those) rates in the event of a Mandatory Evacuation. If Gulf Shores is open to arrival/departures you will be expected to honor your commitment as will I.